As some of you may know by know I'm installing my own pool, and I'm doing a lot myself. And I post a lot. lol. I'm running the electrical connections tonight, and I keep seeing this same statement that befuddles me. "Never ground pool pump to Power Center"
So, obviously the top left Ground leg, connects to the Ground wire coming from the Branch Circuit (really the Intermatic T104R Timer in my case). 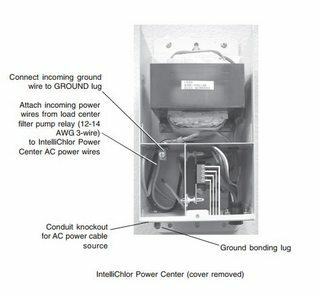 But, the Common Bonding Lug (bottom of picture above (Figure 1), external to enclosure) connections to the bonding wire coming from the pool AND is connected to the bonding lug on the bottom of the pump, right? See example setup figure 2. I think I might be reading into the documentation too much, but I think what they are trying to say is [don't connect the "internal lug" of the SWG to the external bonding lug on the pump. No you are not crazy and the Pentair instructions don't use US terms. You are correct. The internal screw is for the equipment grounding conductor -- the "ground wire". The external lug is for the bonding system. The 8 guage solid copper wire that connected to the lug on the pump case. A SWCG is part of the water circulatory system and must be connected to the bonding system. 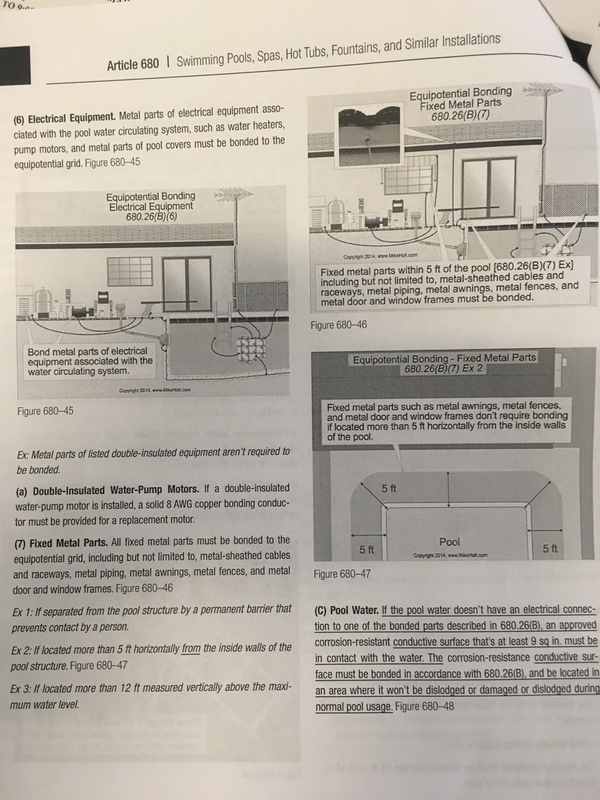 You are also correct, I think on page 5 they are saying don't connect the pool bonding wire to the internal equipment grounding conductor screw terminal. Man those instructions are bad. My electrician friends tell me that the power center doesn't need to be bonded to the bonding wire that connects the pump, heater, rebar, etc. he says the code says that it is not part of the pool equipment. He also said that you can bond it if you want. The grounding lugs on the inside of the panel are the equipment grounding lugs. It should be connected back to your main panel. He also said if your run is over 100 feet you could also drive a secondary ground rod near the panel. If you did that you would also connect a ground wire from the rod to the lugs inside the panel. If you are really unsure, call your inspector. He will tell you what you need to do. Or when he inspects it, he will tell you it's not done right and will tell you what to do. Well Dog we are going to have to agree to disagree here. The last sentence of 680.26(B) states that remote panelboards, service equipment and electrodes need not be bonded. Which is what I think your guy is thinking of. 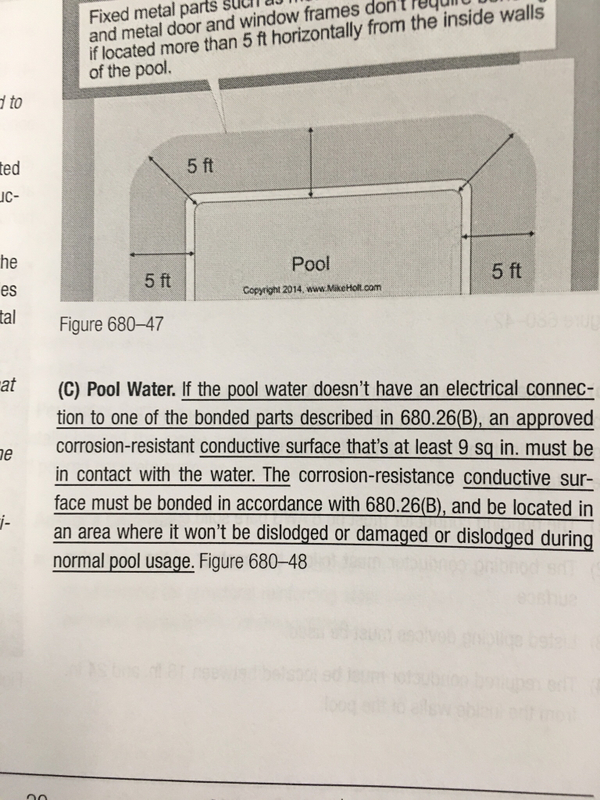 680.26(B)(6) however provides that metal parts of electrical equipment associated with the pool water circulatory system must be bonded. No matter where they are. I interpret that as a requirement that SWCG must be bonded. What is the purpose of a secondary ground rod. Its allowed but not required by the code. What is the purpose? None of the pool equipment instructions call for a grounding electrode. Its not going to have a lower resistance back to the transformer than the equipment grounding conductor. So why? And as with all secondary ground rods if the equipment grounding conductor back to the service entrance fails then the ground rod is feeding the fault back into the ground near the pool. Why would you want that? With the pool bonded that may mean that the faulted current introduced by the ground rod is "spread" to the pool and its entire structure. Hopefully the pool is properly bonded. The NEC and the industry have spent a great deal of effort trying to remove electrical paths to pools (for example no ground wires on nicheless lights or low voltage lights within five feet of the pool.) And now you are suggesting that a faulted current source be located near a bonded pool? I don't agree. So do LA or Burbank city inspectors pass SWCG control boxes without bonding? I do grant you that 680.26(B) its not easy to understand. But I just don't read it that way. It is confusing and that's why I told the guy to contact his inspector for clarification on the rules. Actually mine passed inspection without the eztouch being bonded to the motor, heater rebar, etc bond. When I saw that It wasn't connected. I did it myself. That's was a couple weeks ago when I had noticed and asked my guy about the code. I believe there was another post rolling around where you and I were possibly corresponding. That's when I talked to my buddy. 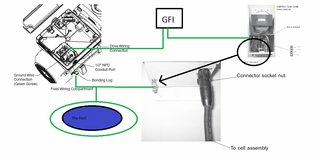 You know when you connect the bond wire to the panel you are basically connecting it to the electrical ground. The external bonding lug is attached to the can. The ground bars and neutral bars are connected to the can. They aren't isolated. 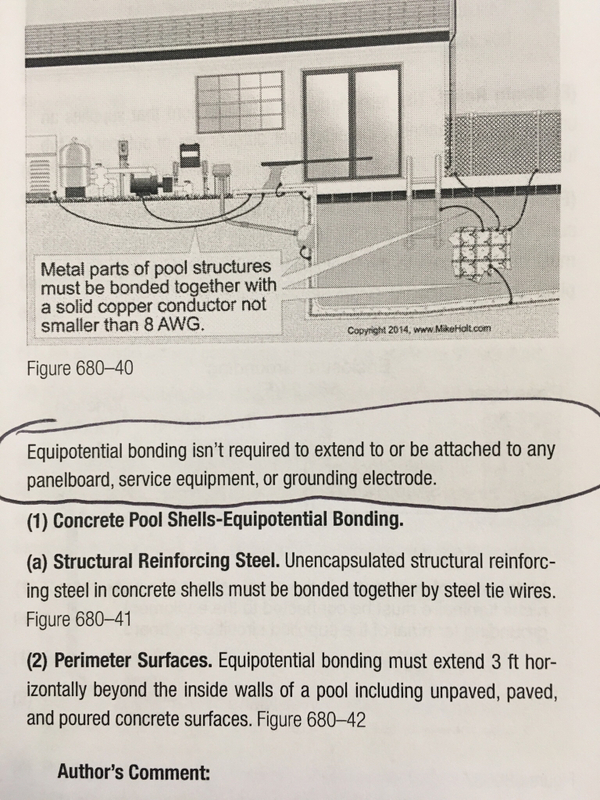 His reasoning that the panel wasn't connected to the bonding system was that it isn't part of the pool equipment. He means pump, heater, filter, etc. You may be exaggerating a bit on the effect of the over current and it's path or the danger. I've had friends blown up and burned because of a phase to phase short when they were working hot. I believe That's much more dangerous than a ground fault. I'd have to contact my grounding expert at one of my vendors. The next time I see my superintendent of the company I will ask him how he interprets that part of the code. He's been in the trade for 40 years. Call the inspector for clarification. I called in under ground electric for Friday (Pool light runs). The inspector is actually pretty helpful, I chatted with him a bunch last itme he was here. I'm sure he'll be happy to point me in the right direction. All the inspectors show up and say, "your the guy doing this yourself right?" Then they proceed to actually be really helpful. So that's awesome! I'll have all the electrical work done before Friday, So I'm going to see if I can just get all the inspection done at the same time. I installed 12V Low voltage LED lights in my light nitches and I ran a #8 bond wire from the light back up the conduit to the pad. The light has a ground wire and I ran a separate bonding wire. Inspector told me it was code (Seminole County Florida). Most of the time when you do an owner/builder the inspectors are much nicer. When I did my home addition by myself in 1999 I experienced the same thing. I was able to submit my drawings on 8 x 11 paper over the counter. The inspector was always helpful to and never wrote me up. Just told me to fix it before he came back. The Bonding Jumper is NEC. Did they require insulated wire and termination in the niche covered by potting compound? Gwegan. I just spoke to my superintendent. More mixed answers. He said that you don't need to bond the ET panel using the exterior lug to the bond wire that connects the motor, heater, rebar etc. he says that if you do bond it, it just creates a better ground. Once everything is at the same electrical potential, and you tie it back to the can it is basically a ground loop now since the ground is is tied to the Same metal can. He also said you don't need a ground rod at the ET either. He did suggest that you run the same size ground wire as the feeder wire and don't derate the ground. Many feeds for 50 amps will use #6 with a #10 ground. Again, my ET panel passed inspection without being bonded. He told me to take it off. 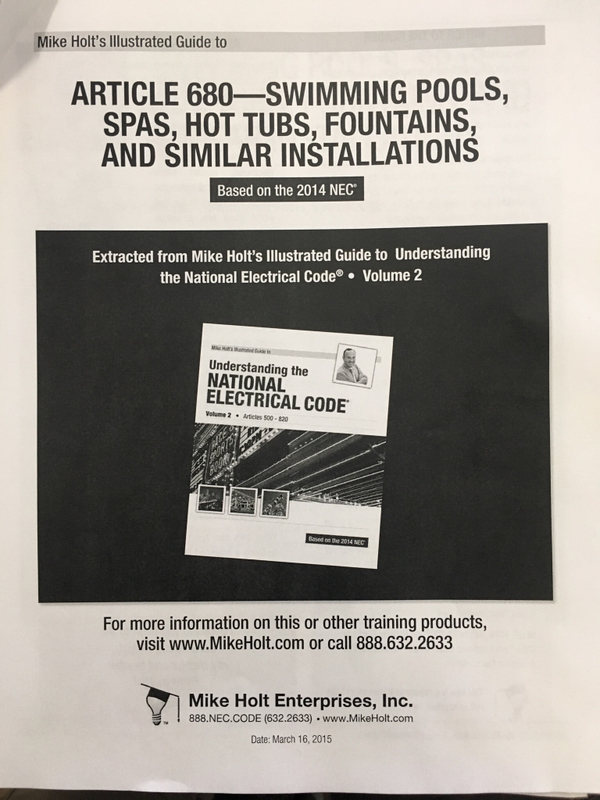 The way he reads 680.26 (b) metal parts of electrical equipment associated with the pool water circulation system such as water heaters pump motors and metal parts of pool covers must be bonded to the equipotential grid. He says it excludes the ET as that is not part of the circulation system. I'd refer you again back to your local inspector for clarification on the rules. You can also search mikeholt.com and read his articles on his interpretation of the code. These pictures are from Mike Holts illustrated guide to article 680. It says equipotential bonding isn't required to extend to or be attached to any panelboard, service equipment or grounding electrode. I passed underground and had him take a look at what I had for bonding. I have a design change going in for the deck so he couldn't inspect it until our changed are approved. What are your thoughts on that being bonded too? I've read mixed things online about it. See photo below. It's from the same resource as the ones I posted above. Looks like it needs to be bonded if it is within 5 ft of the pool regardless of height. Where's gwegan when we need an answer?